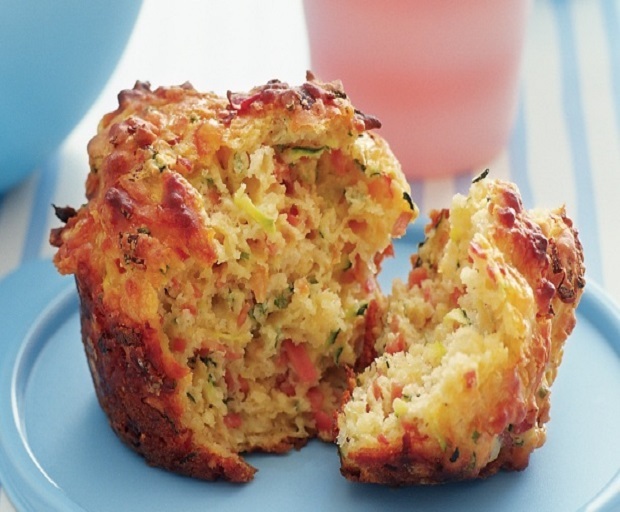 These savoury muffins are so easy to make, perfect for a weekend lunch if you have visitors coming over or simply a tasty snack to munch on. You can enjoy them warm or cold – my favourite is warm with a little bit of butter that melts just a tad… yum! Preheat oven to 200 degrees Celsius and grease well a six-cup Texan muffin pan. Sift flour into a large bowl then add cheese, mortadella, zucchini, shallots and bacon. In a jug whisk milk, egg, and chutney until combined. Make a well in the middle of the dry ingredients then pour in milk mixture. Gently mix until combined then spoon mixture into muffin pan. Sprinkle uncooked mixture with a small amount of smoked paprika. Bake for 15-20 minutes or until a skewer inserted comes out clean. Before I became a mum, I had a vision of my kids eating healthy and having very little processed sugar. The hard part about turning this vision into reality was that I loved sweet treats myself and I wasn’t prepared to give them up. That’s why I started experimenting with sugar-free baking, trying to find a good alternative to processed sugar both for my kids and myself. Most of the recipes I invented didn’t work out – there’s something about sugar that contributes not just to the taste, but also to the texture and without it my cakes, muffins and cookies were coming out too flat, too funny looking or even liquid! Very few of my attempts were successful and here’s one of them. Preheat the oven to 200 degress Celcius. Grease the muffin tray or line up with muffin cups. Combine the dates, bananas, milk, vegetable oil and eggs in a blender or food processor. Stir the liquid mixture into the flour. Spoon the batter into the muffin tray and bake for 20-25 minutes or until golden brown. 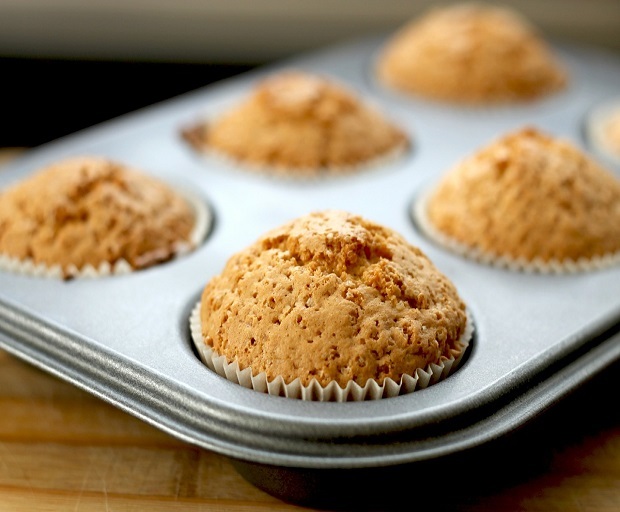 Remove the muffins from the tray immediately and allow to cool on a wire cooling rack. My vision of sugar-free children crumbled as soon as my kids started getting invited to birthday parties. They couldn’t resist the temptation of lollies, cakes and ice creams. 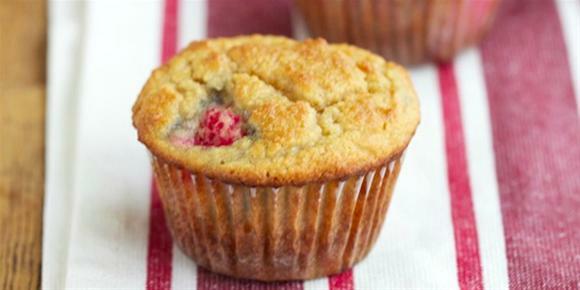 We still try to eat as healthy as we can at home and we still make these muffins (they are a perfect lunch box treat). I hope you enjoy them, too. Despite what you might think, dark chocolate does have some health benefits, except when combined with sugar, eggs and white flour we can’t exactly say that it’s ‘healthy’. So I’m not going to lie, this recipe is definitely NOT healthy but it’s a fabulous treat if you have friends coming over for dinner or you simply need to indulge in some chocolate. They take less than thirty minutes to make and I can guarantee they won’t disappoint! Grease a six hole jumbo muffin pan. Place half of the chocolate into a bowl with the butter and place over a gently simmering saucepan of water without letting the bowl touch the water. Stir occasionally until melted then set aside to cool. Sift flour, baking powder and cocoa into a large bowl then add sugar. In a separate bowl whisk milk and eggs together. Combine milk and egg mixture with dry ingredients and then add the melted chocolate. Stir together then divide the mixture between the six muffin pans. Bake for twenty minutes or until cooked through. Remove from muffin pans and set aside to cool. Melt remaining chocolate in a bowl over a gently simmering saucepan of water. 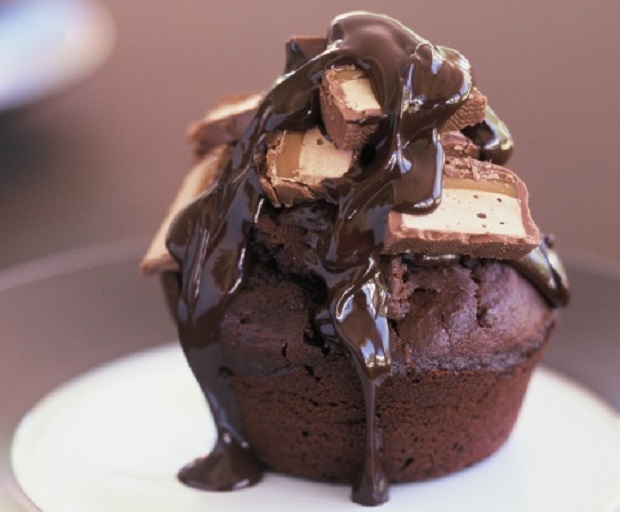 Cool slightly then drizzle some chocolate over the Mars bar slices before piling them on top of the muffins. Drizzle muffins with the last of the chocolate and serve with a dollop of whipped cream. 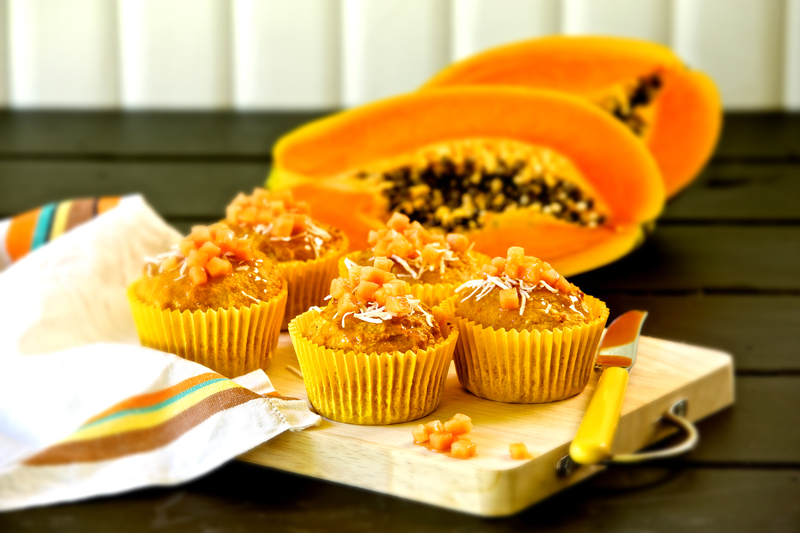 Made from fresh fruits and nuts, these delicious muffins are sure to keep those sugar cravings in control when the afternoon hits. Save yourself (and the family) a few calories by skipping out on the extra sugar, and try out this easy recipe which is perfect if you’re a beginner in the kitchen. Preheat the oven to 180ºC and spray a muffin tray with canola oil. Combine the flour, brown sugar, baking powder, cinnamon and salt into a medium bowl then mix well. In another bowl, beat the eggs, vegetable oil and milk until the mixture is smooth. Combine both mixtures together, then add 2/3 of the strawberries, bananas and pecans. Fill the muffin cups almost to the top, the sprinkle the remaining fruits and nuts over the mixture. Bake for 20-25 minutes, and allow to cool before serving. 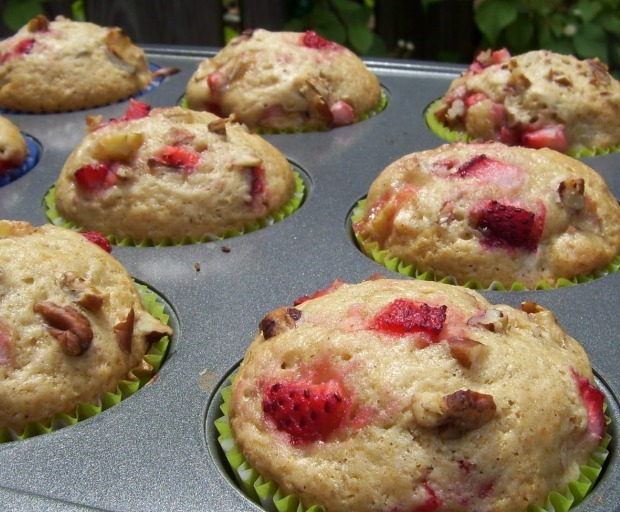 These delicious nutty banana muffins make a great breakfast or snack. 1. Combine thebanana, sugar, milk, nut spread and eggs in a large bowl. Add sifted flour and spice to the wet mixture along with raisins. Mix until just combined. 2. Spoon mixture into 12 patty paper lined 1/3 cup muffin pans. Bake in a hot oven 200°C for 15 – 20 minutes. Allow to cool. 3. 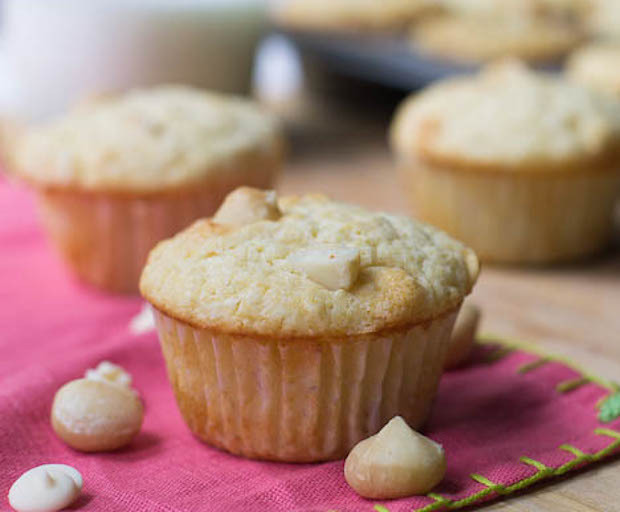 Spread muffins with a teaspoon of extra nut spread and sprinkle with toasted almonds. Serve immediately. What are your favourite muffins? 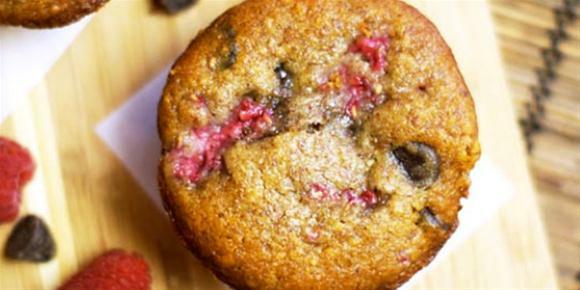 The perfect morning or afternoon tea treat, bake a batch of these delicious pear, raspberry and choc chip muffins over the weekend and enjoy with a cuppa! 1. Sift dry ingredients into a large bowl and stir in choc chips. and cooling on a wire rack. 4. Dust icing sugar over muffins before serving. These luscious pear and Belgian chocolate muffins are just the thing to wake up to – served with lashings of butter and freshly-brewed coffee! 1. Preheat the oven to 180°C. Line a 12-hole muffin tin with paper cases. 2. Sift flour and sugar into a large bowl. 3. In a glass jug, whisk together milk and eggs. Make a well in the centre of the dry ingredients and add the milk mixture, stirring until the mixture is combined. 4. Add the melted butter, mixing well. 5. Gently fold in the grated pears and chocolate chips or shavings. Spoon the mixture into the muffin trays, filling about three-quarters full. 6. Bake for 35 minutes or until the muffins are golden and firm to the touch. Test with a skewer and if it comes out clean, your muffins are done. 7. Serve warm with lashings of butter and your favourite coffee. Give chocolate muffins a delicious twist by crowning them with luscious chopped dates, crunchy macadamias and exotic dukkah – yum! 1. Preheat oven to 180°C. Line a 12-hole, 1/3 cup-capacity muffin pan with paper cases. 2. Combine self raising flour, cocoa, sugar and dark chocolate chips in a large bowl. Make a well in the centre. In a separate bowl, whisk the canola oil, milk, vanilla and free range eggs. 3. Pour wet ingredients into the dry ingredients well and fold together using a wooden spoon. Stir until just combined; don’t over-mix, otherwise the muffins will be hard. Spoon mixture into paper cases and top with chopped dates and 1 tsp of Table of Plenty Macadamia Dukkah. Additional chopped macadamia nuts can also be added. 4. Place in preheated oven and bake for 25 minutes or until firm to touch. Test with bamboo skewer inserted into the centre; if it comes out clean, they are ready. Allow to rest in muffin pan for 5 minutes. Transfer to a wire rack to cool. Juicy raspberries, crunchy hazelnuts – these muffins don’t just taste fantastic, but they’re packed with antioxidants and healthy oils. Bake a batch of this one bowl wonder for weekend brunch or serve with afternoon tea. ¾ full. Bake for 15–20 minutes or until cooked through and golden.